With the help of an upside down flower pot and old-fashioned hour glass, I’m taking a stand against the sitting disease . . . When asked if I am an active person, my answer is always, “Very. Totally. Always. To a fault.” I run, walk, bike, hike, practice yoga and go the gym when the weather isn’t pleasant. I take the stairs and monitor my daily step count. I don’t watch television. PS: I’m vegan, eat my weight in vegetables and I don’t smoke. It is fitting that, being wrong for the first (and only) time in the history of our relationship (past and future), the magnitude of error was higher than expected. I was not only wrong, I was dead wrong. Sitting is not the same as standing. And the longer you sit, the worse it gets. According to Dr. James Levine of the Mayo Clinic, “Excessive sitting is a lethal activity.” Now termed the “sitting disease,” the overwhelming consensus in the scientific community is that sitting is like smoking and sugar consumption: a slow but sure way to kill yourself. Seriously? One episode of Sixty Minutes costs 22 minutes of life? At least watching TV lends itself to raiding the refrigerator every half hour, so you are more likely to move. When I’m working on my computer, my hands and brain are so busy that I only get up to avoid peeing my pants. 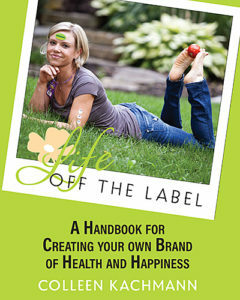 It took three years to write Life Off the Label: A Handbook for Creating Your Own Brand of Health and Happiness. Apparently, in the process, I adopted the health habits of a couch potato. I can see the headline now: Vegan and Healthy Living Expert Dies of The Sitting Disease. But now I know something I didn’t know before. When you know better, you do better. Prolonged sitting causes premature aging, weight gain, physical pain, reduced mental acuity, depression, heart disease and cancer. Inactivity significantly reduces cellular functions: DNA repair mechanisms are disrupted, insulin response drops, oxidative stress rises, and metabolism slows to a stop. The more we sit, the lower our quality of life and the earlier our death. But anyone who is on their feet all day knows that sore feet, back pain and even circulation problems aren’t awesome alternatives. The cure for the sitting disease appears to be movement. Frequent switching from one posture to another reduces the problems caused by both. Staying in one position for no more than 30 minutes is ideal. My workstation is now a standing desk. I want a motorized one with adjustable arms for my monitor and keyboard. For now, I’m using a flowerpot turned upside down. When the sand runs out in my old-fashioned half-hour glass, I stretch and do stair laps, wall pushups and squats. Curing the sitting disease is the equivalent of quitting smoking and it feels great! 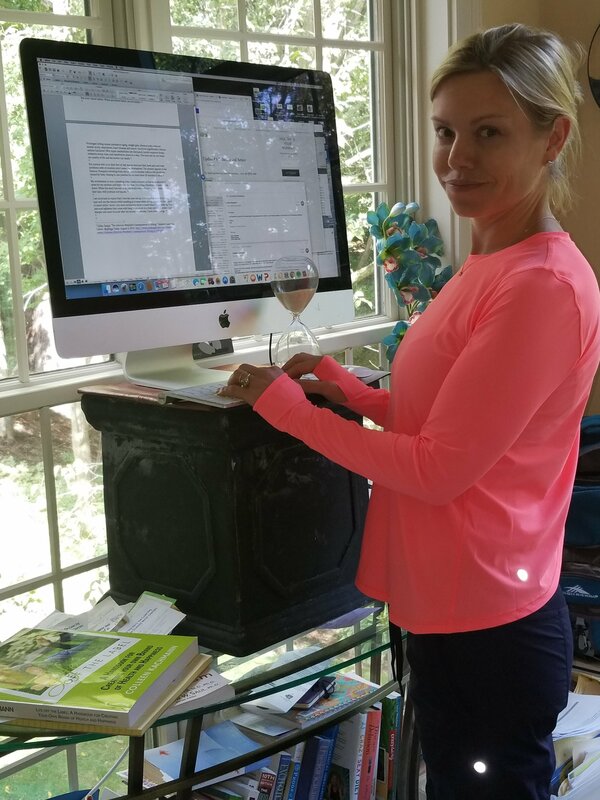 I am surprised to report that it feels just as natural to read, type and use the mouse while standing as it does when sitting. (My OCD survives my ADD.) Standing up actually feels better. (I feel like a boss.) My breathing is deeper and I’m more inclined to move around since I’m already on my feet. The pain and tightness that come with long hours stuck in a chair have all but disappeared. After my movement breaks, I am sharper and more focused. In general, I have more energy. If work requires you to be in one place, get creative. Life is too short to feel anything but awesome. Share this info-graph with someone you love. Don’t race for the cure to disease. Stand up.